NOTE from DearMYRTLE: The following was just received from our friends at FHISO regarding Ancestry.com. Please address all inquiries to Andrew G. Hatchett III, FHISO Acting Secretary. agh3rd@fhiso.org. representation of family history and genealogical information. As a founding member, Ancestry.com will designate five organisational member representatives to participate with other FHISO members from the global genealogical community. Ancestry.com is the world's largest online family history resource, with 1.9 million paying subscribers. More than 10 billion records have been added to the site in the past 15 years. Ancestry users have created more than 34 million family trees containing approximately 4 billion profiles. In addition to its flagship site, Ancestry.com offers several localized Web sites designed to empower people to discover, preserve and share their family history. 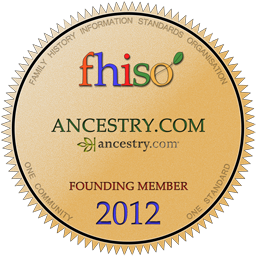 Please join us in welcoming Ancestry.com and their member representatives to FHISO! This is exciting news! It's nice to see a large player in the genealogy space participating in efforts to standardize genealogy practices. Is the goal for FHISO to develop specific FHISO products or simply standards to which others will build such as with cellular/mobile technology standards created by ITU? Definitely looking forward to see what is to come from BetterGEDCOM body of work. Thanks for the update.